The artwork of Warwick Valley Middle School seventh graders (2017-18) takes center stage in the debut exhibit of a StoryWalk project at the Albert Wisner Public Library. 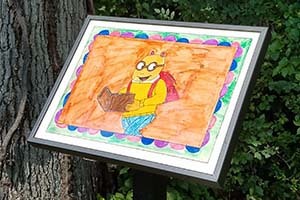 A celebration of children’s literacy through the students’ portrayals of favorite childhood storybook characters, Warwick’s premiere StoryWalk is installed on the library grounds, along the grassy path extending between the new patio area and the far end of the parking lot. Future StoryWalk exhibits will present picture books, frame-by-frame, and give children the opportunity to enjoy reading and the outdoors at the same time. 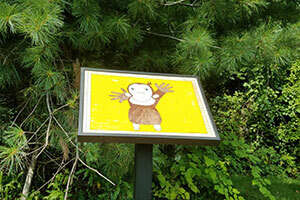 StoryWalk® was conceived and developed in Montpelier, VT, with the support of its public library. There are now StoryWalks® in all 50 states and in 14 countries across Europe and Asia. 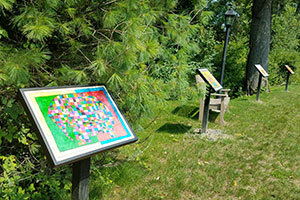 The first of its kind in Orange County, Warwick’s StoryWalk project was made possible by the generous support of the Albert Wisner Public Library Foundation, and members of the Village of Warwick Department of Public Works who installed the standing frames. The current exhibit will be on view through mid-September. A new StoryWalk will go up in time for the Children’s Book Festival on October 6.